A weaker, shadow demon appeared beside her, kneeling on one knee with his head bowing down to her. Kimiko's eyes opened for a moment as she looked down at the shadow demon, she had almost any demon she wanted under her command. Her peircing yellow eyes could send shivers down any demon...or human's spine. The ddemon dared not raise it's head and continued speaking with its head down. "I have rounded up the demons of this area...They will be here shorty"
Kimiko looked onwards back to the city, she could sence a couple desturbances, two to be exact...No matter, she would deal with them if the time came. Not to mention she had as many disposable demons at her fingertips. Kimiko didnt move, she simply shifted her eyes to the side as she looked at one of the strongest demons there, a wind demon by the name of Tenkuu, he took on the shape of a lion. Tenkuu stepped forward and bowed down to Kimiko, waiting for her to give him an order. She was going to use Tenkuu to attract more hollows. "Go to town...and wait for them, summon them by whatever means nessesary...attract as many as you can...there are already hollows in the city...your brother, Tei is already there, he produced a wonderful turn out...lets see if you can do the same...."
She nodded once more before Tenkuu dissaeared in the howling wind towards the pizza plaza. Above the skies of Italy a large, crystal colored cloud could be seen taking structure in the shape of cross. Soon, this formation would take a solid state in the form of ice and eventually, after a large burst of spiritual pressure was detected behind the cross, an enormous explosion covered the entire sky for about two miles as a crystal colored light could be witnessed from across the entire city. When the light dimmed and faded, the area below started to freeze slightly as the air temperature dropped to a frigid -10 degrees in Fahrenheit. What was left from the cross could also be seen scattering across the city while it even began to snow within ground zero of where this blast took place. Very soon, after five post have pass, it would expand to almost half the city. Meanwhile, what was left where the cross stood was a massive hole in the sky taking the outline of an "X" this time. From out of the dark void, a man with long crystal colored hair could be seen emerging with what seemed to be a Zanpukto in his hand. Currently, he had on a an outfit that was in similar color as his hair. He had silver/blueish colored detached sleeves, scarf, pants and shirt with seven stitched X's on the left side along with what had appeared to be a Japanese symbol on the right side of his shirt. It was also apparent that he had fishnets underneath his clothing, three hair clips on the left side of his face and grey nail polish on his finger nails. "Your allies have arrived, Lady Kimiko...."
Bellowed Aisu's voice throughout the entire city with a slight sense of pleasure in his voice. This was followed up with Aisu slowly stepping out of the portal and having hundreds, if not thousands, of men, women, hollow's, Arrancar's, Humans, demon's and many other races appearing directly behind him giving off an AWFUL feeling of spiritual pressure. "The elite of the elite are sent to the Onyx Cross. The strongest from each of the Kokuryuteshi are sent here and guard the Arteria Cranium, as well as the Dragon's Den. Most of them are Vizards or high-level Arrancar...."
Pointing his sword down, Aisu smiled and had a white colored cero begin to form at the tip of his blade. "Though, today, I am making an exception for you. The Onyx Cross Lieutenant Commander is here to aid in combat." And with that, Aisu let out a small chuckle before firing his destruction cero that wiped out an entire cities block of buildings, cars and other humans that were caught up in the blast. As a big ball of smoke was seen raising into the skies, Aisu put out his right hand and commanded his squad to go out and attack the city. And with that yell, the thousands of able bodied warriors of Kin's army were sent directly into the city to lay waste to it in order to compete their mission. Feeling a immense spiritual pressure, he looked around a little bit looking high into the sky as he then cut a hollow's head clean off of it's own body making it fall to the floor and then disappear he then spun back and then fell onto his feet with a soft thud moving quickly he then jumped in the air as he cut through another hollow landing back onto the ground pointing his sword into the air all of the sudden a immense pressure could be felt around Sho a loud immense noise started coming from his sword. He didn't like to use his Bankai he thought it wasn't needed but the spiritual pressure and everything that was going on right now it seemed that he would need to be using that very soon. A sound wave was emitted from Sho's sword as it went everywhere, closing his eyes a little bit he then made it so that he could sense everything within this sound wave basically using echolocation. 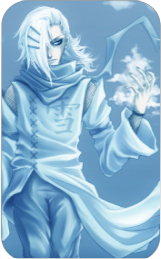 His body flickered as he appeared over the town. He felt a wave of air hit him on his right side as he looked over that way he then saw a bunch of people, dying from a single cero that was fired at them. This was where Sho lost it, lifting his sword a little bit you could feel the spiritual pressure coming from his person unleashing reaitsu almost like it was coming out of him like a flowing waterfall. "BANKAI!" the clouds above him started to swirl almost like a tornado was forming right above him a giant sound wave then exploded from his sword as the spiritual pressure that he was emitting from himself. His body was then gone, disappeared as he appeared back onto the ground but it was almost instantaneous as almost what seemed as if he had cloned himself as there were about 30 of him each one had just killed a hollow or demon, his body was moving that fast that the afterimages almost seemed as if they were real. Flash stepping onto one of the roofs he then raised his hand up toward his face, that was something he didn't want to do but needed to do as he then lowered his hand quickly as a vizard mask appeared on his face, music notes were on the mask as it matched his zanpakutou's power. He didn't use the mask and bankai at the same time, actually he hadn't used it but maybe 5 times because there was no need to, looking up toward Aisu Anzai the Vizard that had just appeared in the sky he then raised his hand toward him, a cero started forming in his hand. This wasn't the normal type of cero, as he unleashed it. A burst of sound was then going with the Cero almost like he had used Bellow and a Cero at the same time. This made is so that a sound wave that could cut someone up and a Cero was heading straight for Aisu. "Heh, it's started it seemed, maybe we should go and help Kiyoko and Aisu out..." The voice came from a dark alley a man in red stepped out of the alley and then onto the street, the hollows in the area were all dead or almost dead as they were limping around with an arm or a leg or something cut off. He felt a strong spiritual pressure that he knew was Sho Sora of the Hashiamatsujiyuu. Walking out of the alley he saw a bunch of people running from a giant hollow that was running straight for them, chuckling a little bit he started walking toward it he past through the people like almost he was a rock in a river as they parted just for him as they kept running the hollow walked up to him and swung it's giant hand as he moved his hand holding out as he barehanded caught the giant fist with just his palm. He then looked up at this giant hollow and then in the blink of an eye he was already on top of the roof as the hollow looked around and then kept going after the humans. Looking around he could feel the reaitsu of Sho become almost that of a hollows looking up toward the sky he then flash stepped next to Aisu as he saw a giant Cero coming straight at them both. "Oh, sh-" He was cut short by the sound wave that was already coming straight at him, getting a couple of cuts on his body then the Cero was coming at him. "BanKai!" All of the sudden red lightning started coming off of him as all of the sudden he gained two knuckles that had 3 spikes on the end of them and then something ninjas used to climb walls, 3 prongs on both of his palms. Almost in a instant he was there and then gone, using flash step to go ahead and step right in front of the Cero, charging his fist as lightning started to sprout off of it he then punched the Cero head on. "Electric Punch!" He yelled as then with a loud boom and then a sound wave that came from the center of impact as it went outward. "Aisu i sense another in this city, i would like you and Kiyoko to take on Sho over there and then ill go after the other one, if you need help you can call other people from K-World." He stated as he then disappeared in a second, soundless flash step as some people called it. Oh what a wonderful feeling it was to feel such spiritual pressure, she hadent senced that in quite some time...One could say she was getting excited/anxious. Kimiko took in a deep breath, her eyes flashing a demonic yellow and a wicked smile shot across her face. More and more demons were flooding in, the ones that were comming in her direction stopped and awaited orders, or just the Go signal. She simply turned her head slightly to them with that same wicked grin on, that even sent shivers down a demon's spine. She turned her head back to where she was looking before; staring out to the city as she scanned the area, sencing her allies having fun. "Awww, they joined in the fun too? 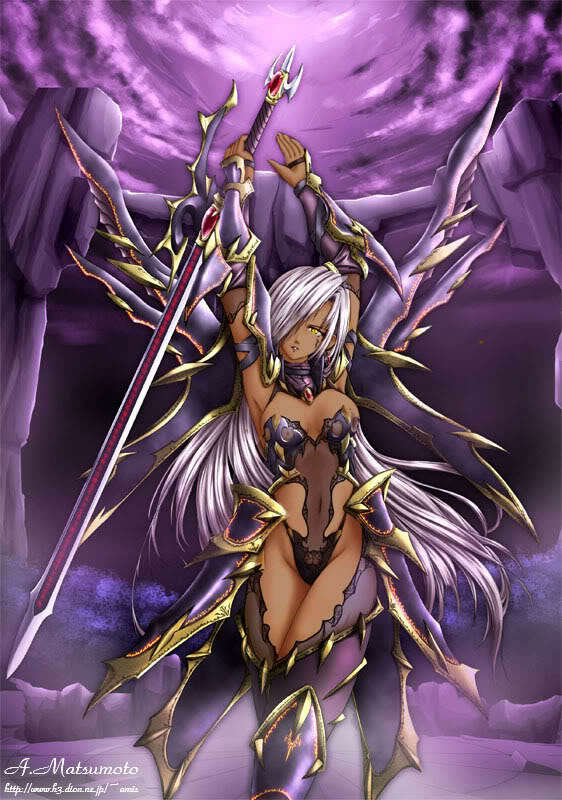 Mhh... Look's like I'll be making an appearance"
She paused for a moment and extended her hand out, palm down a dark ora appeared where her hand was, her hell sowrd appared in her grasp (The sword in her appearance Pic). "Shadow Demons! You will travel with me. The rest of you...Have fun"
With her smirk she sunk into the ground, into the shadows, as did about 250 demons and they were off, off to join in the fun and the completion of their mission. Her and her demons 'resurfaced'/ arrived when all the little blasts were done and gone, she appeard just in time to hear Kuro say for her and Aisu to take on Sho. "Go forth my shaddow puppets, attack the one called Sho Sora" She pointed her balde to where he was and off they went, about 25 of the shadow demons went towards Sho, again; within seconds reaching him (traveling through shadows), and appeared infront of him, attacking him from all sides. Kimiko took her sweet time making her way ofer to Sho, she slayed a few hollows and humans on her way. Oh how she missed the sound of pathetic humans dying by the force of her blade. When she reached Sho, she smikred and tilted her head a bit, watching as the assult from her shadow demons on him took place. Just before the Chaos began within one of the most beautiful cities in the world, a Shinigami that was famous for many things was located within this city. This famous Shinigami was the former Onmitsukido General, former 2nd Division Captain, and former 0 Division General. 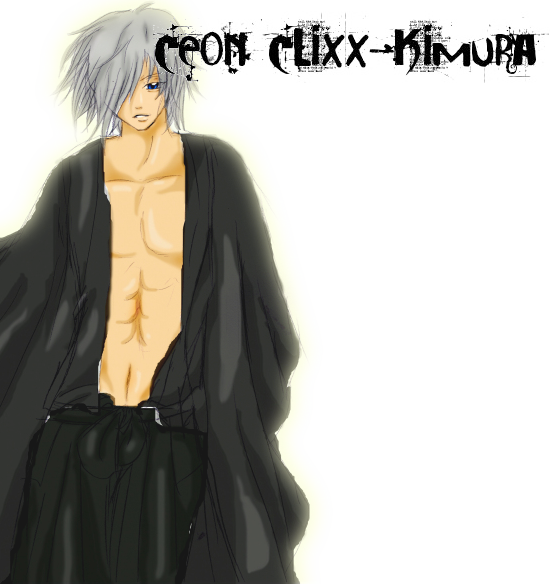 He was the Memory Rosary Ceon Clixx-Kimura, who is also currently AWOL and wanted by the Soul Society for abandoning his duty. Ceon's mission was too important to give up, and he wasn't going to have the Soul Society tell him what he was allowed and not allowed to do mission wise, so he just up and left. His mission to find Midori Sugiura was important because after she disappeared, she was off the radar for ages and no one knew where she was. Ceon couldn't even feel her signature anywhere, and thus, when he felt a slight blip of her trace, he took off immedietly. After leaving Africa, Ceon decided to travel back north to Italy to see if there was any information or trace for her coming through, and of course Ceon came up negative. There were no traces of anything about Midori in this location and it troubled Ceon. He needed to have some other clue, otherwise this world wide chase was going to be useless! Ceon could sense that the Shinigami were in the area as there were not only representatives protecting all areas of the planet, but if Ceon was spotted he was to be reported to Soul Society for confinement. Ceon decided to stay under the radar and keep low. By simply acting as a normal civilian, that would be a great help instead! Ceon decided to sit down and have a nice cup of coffee staying out of the way and a small cafe. The coffee was wonderful, but sadly Ceon's pitstop was about to become interrupted. Ceon had to react quickly! His new ability Aura of the Shamans activated givin Ceon a greenish glow. He shut his eyes, as the "Fire of Vitality" was how in scan. Ceon picked up on a mass amount of enemies with dark energy heading in his direction. It wasn't that they were after him, as Ceon's detection was impossible. It must be something else, and the recent hollow attacks were a diversion to distract the Shinigami representative before he could report to Soul Society with the probible problem. Ceon really didn't want to become involved with the conflict. His mission was to find Midori, not delve in the problems of others. He took another step forward, but then couldn't move again. The image of his daughter entered his head. He knew if this city became under attack, it would cause the Shinigami to deploy here, and that would put Neviah in danger. What kind of father would he be, putting his daughter in danger? 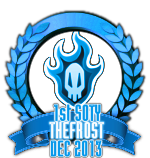 "TO ALL WHOM THREATEN THE INTEGRITY OF LIFE, LEAVE THIS PLACE BEFORE YOU BECOME EXTINGUISHED!" Sho looked at Kimiko that was coming forward after him, looking around a little bit he smirked a little bit apprently Kuro saw him as a threat that needed to be dealt with as soon as possible. All he heard after that was something about shadow puppets going to attack him all at once as he saw about 25 of them start coming at him, smirking a little bit he looked toward Kimiko. "Do you honestly think that this is something that is going to even scratch me." His hollowifed voice seemed to ring out over the battlefield as he felt a spike of reaitsu from a single man that he knew was Ceon Clixx. He raised his hand toward Kimiko. "Hado number 88 Hiryugekizokushintenraiho." Just then a massive blast of lightning came directly from the palm of his hand, it was a huge kidou blast as it started to go straight at Kimiko just as all of the 25 shadow demons decided to jump out toward him, spinning around in 360 degrees he then seemed to weave in and out of the 25 demons almost as if they were nothing, killing them left and right until he was the last one standing. If the hado were to be dodged Sho would then flash step right in front of Kimiko, attacking her right shoulder by swinging his sword from her left shoulder down to her right side trying to just cut her in two. Without even a second of a delay, no matter if it were to hit or not he would then bring his sword from her right to left side horizontally only to jump back without even seeing if his attacks had landed and then swing his sword down from the heaven's. "Bellow Loudly, Aika!" A sound so loud that it would make your ears start ringing followed by a spike of reaitsu that came from Sho as he had swung his sword down, there was a wave of sound that started going directly toward Kimiko, extremely fast, the sound wave had some very sharp parts as it went at her, if not dodged it would practically turn the body into shreds. Before Kaizaken could finish, Ceon's heart was beating faster than ever as his eyes were widened from shock. Kaizaken knew what was going on as he could feel it too.